This is hardly a recipe. This is the second one in like a month BUT, this one is so worth it! For Christmas last year I got my daughter in law dark chocolate covered licorice. She loved it and begged me to find more, which I was never able to do. At the time I thought to myself, "Self, MAKE SOME"! I never did. Do you see a pattern here? Yea, me too. Anyway, in my quest to make something new and exciting, I decided to try these. EVERYONE needs one of those treats that is easy and quick and mindless. This is one of those and it happens to be delicious! The chocolate is what you taste first and then when you get ready for the next bite and that licorice flavor lingers. OH, I just love them! I thought daughter in law was nuts when she loved it so much, but that girl knows what is good! Here we go, simple and easy does it! In an appropriate sized bowl, add in chocolate chips and oil. Microwave for 30 seconds at a time until all melted and smooth. 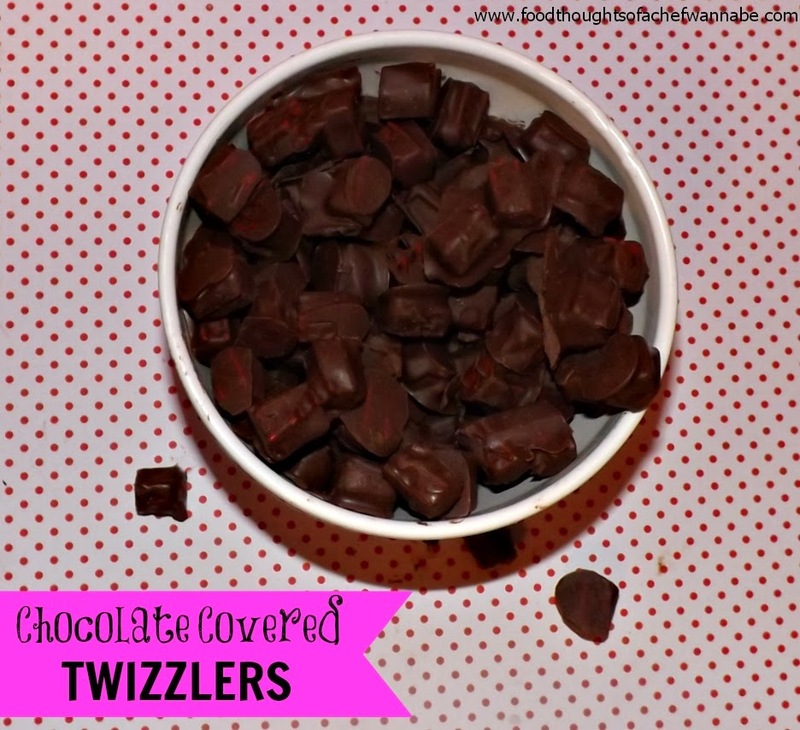 Add a handful of twizzlers at a time, and using a fork pull them out, tap off the excess chocolate and place on parchment lined cookie sheet. Continue until all of the twizzlers are dipped and refrigerate for 1-2 hours. Longer is even better. See!? SO easy, I almost feel bad dedicating an entire post to it!